Professor Roland Winston, director of UC Solar, hopes to apply his XCPC solar thermal technology to California's water problems. The 2015 UC Solar Research Symposium is 8 a.m. to 4 p.m. Friday, Oct. 16 at the California Public Utilities Commission Auditorium, 505 Van Ness Ave., San Francisco. The symposium is free and open to the general public. Come learn about present and future UC Solar research initiatives, and the current state of the solar energy industry in California and beyond. Register for the symposium on the UC Solar website. 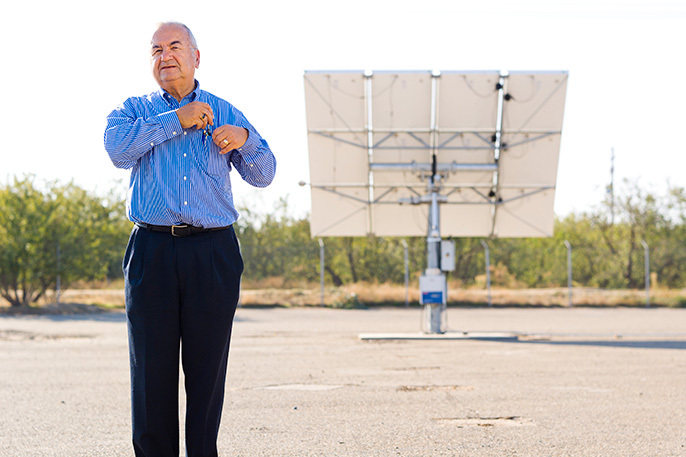 In the midst of California’s ongoing drought, researchers at the University of California Advanced Solar Technologies Institute (UC Solar) at UC Merced are turning to an unlikely ally to help solve the problem of water availability for California’s farmlands: the sun. “Any adoption of solar technology will help with climate change in the long term, because it reduces our use of fossil fuels,” says Ron Durbin, executive director of UC Solar. But UC Solar’s latest project, which will be presented at the upcoming 2015 UC Solar Research Symposium, aims to show that solar technology can be of short-term help as well, by making water desalination cheaper, more accessible and cleaner. With severe water shortages affecting California agriculture, farmers increasingly are using reclaimed irrigation water. This approach conserves water, but it comes with a problem: salt. Any use of irrigation adds salts to the soil, and each time water is reused, it gets dirtier and saltier – a problem exacerbated by the widespread use of fertilizers. The need for a solution is becoming more urgent. Salinization is a growing problem worldwide, not just in drought-stricken California. The United Nations University’s Institute for Water, Environment and Health estimates that 5,000 acres of previously productive farmland are lost every day to salinization around the world. In California, the effects of salinization are felt most acutely in the San Joaquin River basin and the Tulare Lake basin, where drainage is limited. “Desalination is going to have to be part of a sustainable water future for California,” says Roland Winston, director of UC Solar. But while there has been talk of using desalination for years, there hasn’t been widespread adoption in the farming community. No desalination system is perfectly efficient. “You end up with a lot of salt and a lot of water as well,” says Winston. Historically, salty wastewater in inland areas has been dealt with using an old-fashioned solar approach: evaporation ponds. But ponds are slow, inefficient and potentially hazardous to the environment and wildlife. In the early 1980s, high selenium concentration in ponds in the Kesterson National Wildlife Refuge, caused by irrigation drainage water, led to birth defects and deaths in migratory birds and prompted wildlife officials to close and seal the refuge’s ponds. Commercial evaporation systems have been widely used by industry for the treatment of wastewater, but existing technology is energy-intensive and reliant on fossil fuels. UC Solar’s approach aims to address previous problems using a unique solar thermal technology, developed by Winston at UC Merced, called an “external compound parabolic concentrator” (XCPC) that captures sunlight – not for generating electricity, but to harness its heat for various industrial applications. The XCPC system has been in use since 2011 in UC Merced’s Solar Cooling Demonstration Project, powering air conditioning in a real-world setting; it also is being used to heat buildings at the Mongolian National University. “Its non-tracking design enables it to be installed in any number of ways, including on rooftops and walls. You don’t have this type of architectural flexibility with tracking thermal systems,” says Winston. Unlike other solar thermal systems that are available, the XCPC system is inexpensive, lightweight and works well even on hazy or partly cloudy days. In August, UC Solar was selected to receive a grant from the California Department of Water Resources to demonstrate a solar thermal-powered evaporation system, study its effectiveness in processing agricultural drainage, and assess its economic and environmental viability as part of a zero-liquid discharge system for drainage water reuse. Winston and Durbin see several clear advantages to using UC Merced’s solar thermal technology for desalination: It’s carbon-neutral, cheap, portable, highly scalable and, unlike evaporation ponds, the solar thermal system can do its work in a controlled space, presenting no hazard to wildlife.